Sleaford Town were handed another home tie after coming through their first test in this season’s FA Vase against Sandiacre on Saturday. Town edged Sandiacre 2-0 despite an underwhelming display against the Derbyshire side to reach the first round proper of the national knockout competition. There they will face familiar foes in United Counties League rivals Peterborough Northern Star on Saturday, October 13. The visitors edged a poor first half of few chances at Eslaforde Park, with George Couzens seeing one effort blocked and another deflected out for a corner, while Harry Millard’s header also failed to work the keeper. And keeper Garry Doran had to come to their rescue midway through the half when Sandiacre threatened from a two-on-two. With memories of last month’s meek FA Cup surrender still fresh, the home side finally hit the front with 12 minutes left after a series of corners when Leigh Warman headed in from Millard’s cross. And with the visitors pushing forward in search of an equaliser, Michael Hayden made it seven goals for the season when he calmly finished off a counter-attack, launched from a Sandiacre free-kick. Town manager Jamie Shaw was pleased to win through, and the club’s coffers received a £725 boost for winning the tie, but the Town boss will want more when they return to league duties this weekend. “It was great for the club to have won, but in all honesty, our performance was poor,” he said. “Sandiacre shaded the first half, although we did have two golden opportunities. “After a frank half-time discussion we did improve in the second half although we were still some way off the quality we expect. Town have now won five of their opening eight matches in all competitions and lie sixth in the Premier Division. They travel to 16th-placed Harborough Town on Saturday, and then host Holbeach United in the first round of the League Cup on Wednesday evening (kick-off 7.45pm). * The club’s new development squad have confirmed their first fixture for next month. 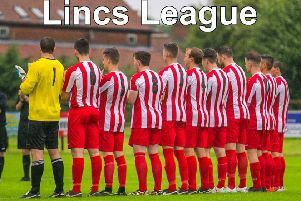 They entertain Ruskington Rovers on Wednesday, October 3 (7.30pm kick-off). Entry is £1 for adults, and free for under 16s.